What is the history of leprosy (Hansen's disease)? What are leprosy early symptoms and signs? Are there different forms (classifications) of leprosy? How does leprosy spread? Is leprosy contagious? How do health care professionals diagnose leprosy? What are the complications of leprosy? What health care specialists treat leprosy? Is it possible to prevent leprosy? What is the prognosis of leprosy? Where can I find more information on leprosy? Leprosy is a slowly developing, progressive disease that damages the skin and nervous system. An infection with Mycobacterium leprae or M. lepromatosis bacteria causes leprosy. Early symptoms begin in cooler areas of the body and include loss of sensation. Signs of leprosy are painless ulcers, skin lesions of hypopigmented macules (flat, pale areas of skin), and eye damage (dryness, reduced blinking). Later, large ulcerations, loss of digits, skin nodules, and facial disfigurement may develop. The infection spreads from person to person by nasal secretions or droplets. Leprosy rarely spreads from chimpanzees, mangabey monkeys, and nine-banded armadillos to humans by droplets or direct contact. Susceptibility to getting leprosy may be due to certain human genes. Leprosy is a disease mainly caused by the bacteria Mycobacterium leprae, which causes damage to the skin and the peripheral nervous system. The disease develops slowly (from six months to 40 years) and results in skin lesions and deformities, most often affecting the cooler places on the body (for example, eyes, nose, earlobes, hands, feet, and testicles). The skin lesions and deformities can be very disfiguring and are the reason that historically people considered infected individuals outcasts in many cultures. Although human-to-human transmission is the primary source of infection, three other species can carry and (rarely) transfer M. leprae to humans: chimpanzees, mangabey monkeys, and nine-banded armadillos. The disease is termed a chronic granulomatous disease, similar to tuberculosis, because it produces inflammatory nodules (granulomas) in the skin and peripheral nerves over time. Unfortunately, the history of leprosy and its interaction with man is one of suffering and misunderstanding. The newest health research suggests that M. leprae has infected people since at least as early as 4000 B.C., while the first known written reference to the disease was found on Egyptian papyrus in about 1550 B.C. The disease was well recognized in ancient China, Egypt, and India, and there are several references to the disease in the Bible. Many cultures thought the disease was a curse or punishment from the gods because they did not understand the disease, it's very disfiguring, slow to show symptoms and signs, and had no known treatment. Consequently, priests or holy men treated leprosy, not physicians. Since the disease often appeared in family members, some people thought it was hereditary. Other people noted that if there was little or no contact with infected individuals, the disease did not infect others. Consequently, some cultures considered infected people (and occasionally their close relatives) as "unclean" or as "lepers" and ruled they could not associate with uninfected people. Often infected people had to wear special clothing and ring bells so uninfected people could avoid them. The Romans and the Crusaders brought the disease to Europe, and the Europeans brought it to the Americas. In 1873, Dr. Hansen discovered bacteria in leprosy lesions, suggesting leprosy was an infectious disease, not a hereditary disease or a punishment from the gods. However, many societies still ostracized patients with the disease, and religious personnel at missions cared for those with leprosy. Patients with leprosy were encouraged or forced to live in seclusion up to the 1940s, even in the United States (for example, the leper colony on Molokai, Hawaii, that was established by a priest, Father Damien and another colony or leprosarium established at Carville, La. ), often because no effective treatments were available to patients at that time. Because of Hansen's discovery of M. leprae, researchers made efforts to find treatments (anti-leprosy agents) that would stop or eliminate M. leprae. In the early 1900s to about 1940, medical professionals injected oil from Chaulmoogra nuts into patients' skin was with questionable efficacy. At Carville in 1941, promin, a sulfone drug, showed efficacy but required many painful injections. Dapsone pills were found to be effective in the 1950s, but soon (1960s-1970s), M. leprae developed resistance to dapsone. Fortunately, drug trials on the island of Malta in the 1970s showed that a three-drug combination (dapsone, rifampicin [Rifadin], and clofazimine [Lamprene]) was very effective in killing M. leprae. The World Health Organization (WHO) recommended this multi-drug treatment (MDT) in 1981 and remains, with minor changes, the therapy of choice. MDT, however, does not alter the damage done to an individual by M. leprae before starting MDT. Currently, there are several areas (India, East Timor) of the world where the WHO and other agencies (for example, the Leprosy Mission) are working to decrease the number of clinical leprosy cases and other diseases such as rabies and schistosomiasis that occur in remote regions. Although health researchers hope to eliminate leprosy like smallpox, endemic (meaning prevalent or embedded in a region) leprosy makes complete eradication unlikely. In the U.S., leprosy has occurred infrequently but is endemic in Texas, Louisiana, Hawaii, and the U.S. Virgin Islands by some investigators. 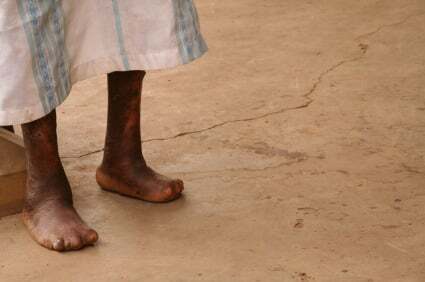 Leprosy is often termed "Hansen's disease" by many clinicians in an attempt to have leprosy patients forgo the stigmas attached to a leprosy diagnosis. Leprosy is caused mainly by Mycobacterium leprae, a rod-shaped slow-growing bacillus that is an obligate intracellular (only grows inside of certain human and animal cells) bacterium. M. leprae is termed an "acid fast" bacterium because of its chemical characteristics. When medical professionals use special stains for microscopic analysis, it stains red on a blue background due to mycolic acid content in its cell walls. The Ziehl-Neelsen stain is an example of the special staining techniques used to view the acid-fast organisms under the microscope. Currently, the organisms cannot be cultured on artificial media. The bacteria take an extremely long time to reproduce inside of cells (about 12-14 days as compared to minutes to hours for most bacteria). The bacteria grow best at 80.9 F-86 F, so cooler areas of the body tend to develop the infection. The bacteria grow very well in the body's macrophages (a type of immune system cell) and Schwann cells (cells that cover and protect nerve axons). M. leprae is genetically related to M. tuberculosis (the type of bacteria that cause tuberculosis) and other mycobacteria that infect humans. They are leprosy-related diseases. As with malaria, patients with leprosy produce anti-endothelial antibodies (antibodies against the lining tissues of blood vessels), but the role of these antibodies in these diseases is still under investigation. In 2009, investigators discovered a new Mycobacterium species, M. lepromatosis, which causes diffuse disease (lepromatous leprosy). Considered one of the tropical diseases, this new species (determined by genetic analysis) appeared in patients located in Mexico and the Caribbean islands. People at highest risk are those who live in the areas where leprosy is endemic (parts of India, China, Japan, Nepal, Egypt, and other areas) and especially those people in constant physical contact with infected people. In addition, there is some evidence that genetic defects in the immune system may cause certain people to be more likely to become infected (region q25 on chromosome 6). Additionally, people who handle certain animals known to carry the bacteria (for example, armadillos, African chimpanzee, sooty mangabey, and cynomolgus macaque) are at risk of getting the bacteria from the animals, especially if they do not wear gloves while handling the animals. This long-term developing sequence of events begins and continues on the cooler areas of the body (for example, hands, feet, face, and knees). Lepromatous leprosy: Early lesions are pale macules (flat areas) that are diffuse and symmetric. Later medical professionals can find many M. leprae organisms in the lesions. Alopecia (hair loss) occurs. Often patients have no eyebrows or eyelashes. As the disease progresses, nerve involvement leads to anesthetic areas and limb weakness. Progression leads to aseptic necrosis (tissue death from lack of blood to area), lepromas (skin nodules), and disfigurement of many areas, including the face. The lepromatous form does not regress to the other less severe forms. Histoid leprosy is a clinical variant of lepromatous leprosy that presents with clusters of histiocytes (a type of cell involved in the inflammatory response) and a grenz zone (an area of collagen separating the lesion from normal tissue) seen in microscopic tissue sections. However, the WHO further modifies these two classifications with clinical criteria because "of the non-availability or non-dependability of the skin-smear services. The clinical system of classification for the purpose of treatment includes the use of number of skin lesions and nerves involved as the basis for grouping leprosy patients into multibacillary (MB) and paucibacillary (PB) leprosy." Investigators state that up to about four to five skin lesions constitutes paucibacillary leprosy, while about five or more constitutes multibacillary leprosy. Multidrug therapy (MDT) with three antibiotics (dapsone, rifampicin, and clofazimine) treat multibacillary leprosy, while a modified MDT with two antibiotics (dapsone and rifampicin) is recommended for paucibacillary leprosy and composes most current treatments today (see treatment section below). Paucibacillary leprosy usually includes indeterminate, tuberculoid, and borderline tuberculoid leprosy from the Ridley-Jopling classification, while multibacillary leprosy usually includes the double (mid-) borderline, borderline lepromatous, and lepromatous leprosy. Researchers suggest that M. leprae spreads person to person by nasal secretions or droplets from the upper respiratory tract and nasal mucosa. However, the disease is not highly contagious like the flu. They speculate that infected droplets reach other peoples' nasal passages and begin the infection there. Some investigators suggest the infected droplets can infect others by entering breaks in the skin. M. leprae apparently cannot infect intact skin. Rarely, humans get leprosy from the few animal species mentioned above. Occurrence in animals makes it difficult to eradicate leprosy from endemic sources. Medical researchers are still investigating routes of transmission for leprosy. Recent genetic studies have demonstrated that several genes (about seven) are associated with an increased susceptibility to leprosy. Some researchers now conclude that susceptibility to leprosy may be partially inheritable. The incubation period for leprosy varies from about six months to 20 years. Physicians diagnose the majority of cases of leprosy by clinical findings, especially since most current cases are diagnosed in areas that have limited or no laboratory equipment available. Hypopigmented patches of skin or reddish skin patches with loss of sensation, thickened peripheral nerves, or both clinical findings together often comprise the clinical diagnosis. Skin smears or biopsy material that show acid-fast bacilli with the Ziehl-Neelsen stain or the Fite stain (biopsy) can diagnose multibacillary leprosy, or if bacteria are absent, diagnose paucibacillary leprosy. Other tests can be done, but specialized labs perform most of these, which may help a clinician to place the patient in the more detailed Ridley-Jopling classification and are not routinely done (lepromin test, phenolic glycolipid-1 test, PCR, lymphocyte migration inhibition test or LMIT). Health care providers may perform other tests such as CBC test, liver function tests, creatinine test, or a nerve biopsy to help determine if other organ systems have been affected. Antibiotics treat the majority of cases (mainly clinically diagnosed) of leprosy. The recommended antibiotics, their dosages, and length of time of administration are based on the form or classification of the disease and whether or not the patient is under medical supervision. In general, two antibiotics (dapsone and rifampicin) treat paucibacillary leprosy, while multibacillary leprosy is treated with the same two plus a third antibiotic, clofazimine. Usually, medical professionals administer the antibiotics for at least six to 12 months or more to cure the disease. Antibiotics can treat paucibacillary leprosy with little or no residual effects on the patient. Multibacillary leprosy can be kept from advancing, and living M. leprae can be essentially eliminated from the person by antibiotics, but the damage done before antibiotics are administered is usually not reversible. Recently, the WHO suggested that single-dose treatment of patients with only one skin lesion with rifampicin, minocycline (Minocin), or ofloxacin (Floxin) is effective. Studies of other antibiotics are ongoing. Each patient, depending on the above criteria, has a schedule for their individual treatment, so a clinician knowledgeable about that patient's initial diagnostic classification should plan a patient's treatment schedules. .
Medical professionals have used steroid medications to minimize pain and acute inflammation with leprosy; however, controlled trials showed no significant long-term effects on nerve damage. The role for surgery in the treatment of leprosy occurs after a patient completes medical treatment (antibiotics) with negative skin smears (no detectable acid-fast bacilli) and is often only needed in advanced cases. Medical professionals individualize surgery for each patient with the goal to attempt cosmetic improvements and, if possible, to restore limb function and some neural functions that were lost to the disease. Special clinics run by the National Hansen's Disease Program may treat some people in the United States. As is the case with many diseases, the lay literature contains home remedies. For example, purported home remedies include a paste made from the neem plant, Hydrocotyle, also known as Cantella asiatica, and even aromatherapy with frankincense. Patients should discuss any home remedies with their physician before using such methods; often there is little or no scientific data to uphold these cure claims. In addition, the sensory loss causes people to injure body parts without the individual being aware that there is an injury. This can lead to additional problems such as infections and poor wound healing. Although pediatricians and primary care doctors usually follow patients with leprosy, health care professionals often make the initial diagnosis and treatment in consultation with infectious disease specialists, dermatologists, neurologists, and/or immunologists. Some patients may require consultation with a surgeon to restore some functions of movement and/or do cosmetic repairs. Many people have exposures to leprosy throughout the world, but the disease in not highly contagious. Researchers suggest that most exposures result in no disease, and further studies suggest that susceptibility depends, in part, on a person's genetic makeup. In the U.S., there are about 200-300 new cases diagnosed per year, with most coming from exposures during foreign travel. The majority of worldwide cases occur in the tropics or subtropics (for example, Brazil, India, and Indonesia). The WHO reports about 500,000 to 700,000 new cases per year worldwide, with curing of about 14 million cases since 1985. Animals (chimpanzees, mangabey monkeys, and nine-banded armadillos) rarely transfer M. leprae to humans. Nonetheless, it is not advisable to handle such animals in the wild. These animals are a source for endemic infections. The prognosis of leprosy varies with the stage of the disease when medical professionals diagnose and treat it. For example, early diagnosis and treatment limits or prevents tissue damage so the person has a good outcome. However, if the patient's infection has progressed to more advanced disease, the complications listed above can markedly affect the patient's lifestyle, and thus the condition has a fair to poor prognosis. Dako-Gyeke, M., E. Asampong, and R. Oduro. "Stigmatisation and discrimination: Experiences of people affected by leprosy in Southern Ghana." Lepr Rev 88.1 (2017): 58-74. Han, X., K. Sizer, E. Thompson, et al. "Comparative Sequence Analysis of Mycobacterium leprae and the New Leprosy-Causing Mycobacterium lepromatosis." J Bacteriol. 191.19 (2009): 6067-6074. Smith, D. "Leprosy." Medscape.com. May 9, 2016. <http://emedicine.medscape.com/article/220455-overview>. Switzerland. World Health Organization. "Leprosy." Feb. 9, 2018. <http://www.who.int/news-room/fact-sheets/detail/leprosy>. Zhang, F., W. Huang, S. Chen, et al. "Genomewide Association Study of Leprosy." N Engl J Med. 361.27 (2009): 2609-2618.